The Oreo Ice Cream Cake with three ingredients is the perfect gift to cool off this summer. It is so easy to do that it never impresses! Yes, I admit, it is a bit of an exaggeration to call this oregano ice cream from Oreo. But then, my friends, that is the beauty of this sweet and frozen treatment. For several hours in the freezer, Oreo biscuits soften into a texture resembling a cake, and the whipped cream hardens to a consistency similar to that of an ice cream. The perfect summer dessert cannot be simpler than that! 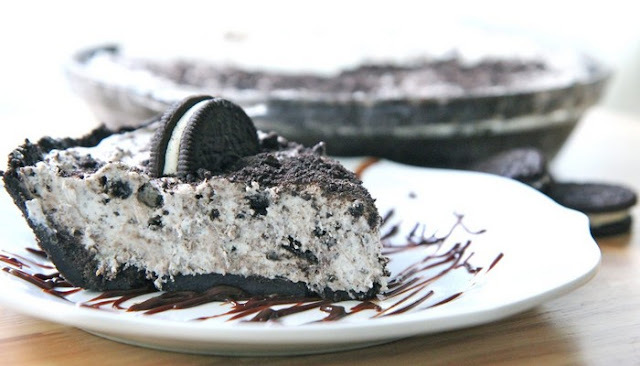 With just three ingredients and less than 10 minutes of preparation time, you will receive an incredible Oreo ice cream cake that will reach both children and adults. The best part is that you can double (or triple!) The recipe to serve a lot or to satisfy the sweet desires at any time. Do you want to make more ice treats? Try my ice cream with two ingredients of dulce de leche, chocolate or strawberry. They are just as easy to make and do not need milkshakes or ice cream. The Oreo Ice Cream Cake with three ingredients is the perfect gift to cool off this summer. It is so easy to do that it never impresses! 1. Dip the Oreo biscuits in the milk for 5 to 10 seconds in a bowl or until tender. 2. Place in an 8 x 8 oven dish Oreo biscuits that are soft in a single layer to cover the bottom of the dish. 3. Pour the whipped cream and spread the biscuits. Repeat the layering with the remaining biscuits and the battered dressing and finish with whipped cream. 4. Smash the remaining Oreo biscuits and sprinkle the battered topping over it. 5. Cover with a plastic film and freeze for about 4 to 5 hours or until it is frozen. Defrost for 1 to 2 minutes and cut into squares to serve. If you want a harder crust, I would use butter, but if you want to cut something healthier and softer with a fork, try the grape seed oil. After mixing, place it in a feather shape (I cover the bottom of the mold in the form of a spring with plastic foil) and press down with your hands to get a soft and compressed crust. 1. Place a good layer of caramel sauce on the crust. 2. Finish the Oreos with a large bag with a tight seal and a roll for the top layer. I have left the pieces a bit bigger this time because I ate a lot of cookies for the first time before I baked the cake and people asked me how many Oreos there actually are. 3. Ice must be almost ready. Divide the ice of the second batch onto the spring-shaped tray, because this is the softer of the two batches. Then I put the spring form in the freezer and had to wait about 10 minutes for the first batch to become a bit softer. 4. Now that all the ice is in the spring-shaped bowl, you can now form the top layer. Start by placing a second layer of caramel sauce on the ice. 5. Place the ground Oreos on the caramel sauce. You may need to use Oreo cookie crumb more than filler. 6. If desired, place some Oreos on the cake as decoration. Bring it into the freezer for at least a few hours before transporting it. I would recommend that it stays in the freezer one night before it is eaten. I would say that 10 minutes is more than enough to soften and start cutting. Also make sure that you put paper towels under the pan, because it can be a bit messy. Because we are testing this summer with a beautiful spring weather, it is logical that this ice is ridiculously good and easy to publish. This cake is the dream of all children (and me) that come true. Layers Oreo, Dulce de Leche, Caramel, Ice Cream: you could put everything there, whatever you want, and it would be good. Because it is Mother's Day this weekend, you can cover it with ice cream and your mother's favorite candies: the choices are endless. I did that with ice cream, candy and caramel, but if you really wanted to do everything you could, you could make these ingredients from scratch. But it is clear why you can make this cake so easy when you buy it with ingredients from the store. Make sure you plan ahead because you have to secure at least a few hours to correctly set up and maintain your form.